Keith Bennett, whose new book Guido Cantelli - Just Eight Years Of Fame is published to co-incide with this series, was my introduction to the short-lived musical world of Guido Cantelli. His ceaseless championing of Cantelli has resulted in a number of releases on various record labels including Pristine, and it's now an immense pleasure to be able to delve into Keith's extensive and meticulously- maintained collection of rare taped recordings for this new series of issues. Each one will take the music from a complete concert broadcast by NBC from Carnegie Hall in the early-to-mid 1950s, with the NBC Symphony Orchestra conducted by Cantelli. Sonically these are a huge improvement over the many concerts the orchestra gave in NBC Studio 8H under Toscanini, Cantelli and others - the Hall's acoustics are of course excellent, and as listeners we also benefit from ever-improving microphone and recording technologies. In remastering I've dealt with the inevitable tape hiss, and also some mild tonal imbalances characteristic of older recordings - XR remastering identifies and remedies many of the imperfections of older microphones. This particular recording - unlike others in this series - is unusually dry for a Carnegie Hall concert. Indeed, it resembles far more the tight, close, dry acoustic associated with NBC's Studio 8H, where all Cantelli's NBC concerts were given prior to January 1951. Whilst this can sound a little unusual or even uncomfortable to the modern listener more used to recordings often drenched in concert hall reverberation, it does allow one to hear very precisely what each musician is doing, and allows the listener to pay real attention to fine detail. This difference was really brought to my attention when comparing the taut and energetic Roussel Sinfonietta on this release with the reference recording used to help in the XR remastering process. In this particular case, I took Neeme Jarvi's Chandos recording with the Detroit Symphony Orchestra - a perfectly fine recording in its own right, but after a day of listening to Cantelli in close-up focus, it resembles a recording made in a particularly large, reverberant cave, with none of the driving impact of the Cantelli. In both sound and interpretation, the two recordings could not be further apart! It is not often that a whole concert can be given unadulterated praise. But this was one of those rare instances. Mr Cantelli brought exquisite and refined musicianship to the interpretation of this programme. Ten years later the writer recorded two performances of the Shostkovich Violin Concerto which had been broadcast and had been performed by Manoug Parikian. He had been leader of the Philharmonia Orchestra for that Cantelli concert and had come to hear the tapes. After the listening session the question of Cantelli’s conducting was brought up and he immediately asked (without any prompting) if I had been present at the performances of the Brahms. Readers should be aware that Parikian also led the orchestra when Toscanini conducted this same work with this orchestra just over twelve months after the Cantelli performance. Nevertheless, Cantelli’s interpretation – even though the view of a young musician – clearly made a deep impression on Parikian and it should be remembered that orchestral musicians (sensitive artists though they may be and Parikian certainly was) are seldom overawed by the baton waving fraternity! Cantelli gave 18 performances of this symphony with eleven orchestras between 23 August 1946 and 3 November 1955. His first performances in the USA were two concerts with his only appearances with Philadelphia Orchestra on 25 and 26 February 1949 (substituting for an indisposed Charles Munch). In 1951 there were two performances with both the Pittsburgh Symphony Orchestra and Philharmonia Orchestra prior to his only performance with the NBC Symphony Orchestra (which is on this CD). The consensus of opinion is that this is the most difficult symphony for the interpreter of the Brahms canon. Certainly Toscanini found it so and despite having asked to hear his earlier performances to get a concept firmly in his mind before making his commercial recording: he was singuarly unsuccessful and if ever there was a Toscanini commercial recording which could be described as an abject failure it may be found here which is somewhat surprising because, just over a month earlier, he had performed this same work with the Philharmonia Orchestra in the Royal Festival Hall which Walter Legge hailed as the finest performance of any work that he had ever heard. Even the bare timings from a stopwatch reveal just how slack the commercial recording turned out to be. Readers may be puzzled to see the entry for Cantelli’s performance on 20 January 1955 devoid of timings: the reason is that although Cantelli completed the performance he was taken ill at the intermission and took no further part in the concert which was then conducted by the associate conductor, Franco Autori and the author considered that – in the circumstances – it would unjust to have this even considered. Three facts should be brought to the reader’s attention concerning Cantelli’s commercial recording: (1) the exposition repeat in the first movement was not taken; (2) the number of sessions required before Cantelli was satisfied was the highest ever (supporting the view that interpreters found this symphony the most difficult of the four); and (3) this was one of his six commercial recordings (eventually) issued in stereo. There is a common misconception that Cantelli’s repertoire was very limited although it is easy to understand how this view arose in the UK where, from his debut in 1950, he only gave 36 concerts with three orchestras (Orchestra della Scala 6; Philharmonia Orchestra 28 and Philharmonic-Symphony Orchestra of New York 2). During that time he performed both the Beethoven Symphony No.5 and the Musorgsky/Ravel Pictures at an Exhibition on three occasions; the Tchaikovsky Symphony No.5 four times and the Beethoven Symphony No.7 five. Such repetitive programming gives the impression of a small repertoire. The fact is that he conducted 198 works of 83 composers (this includes his own Tema con variazioni). However, those bare statistics could be construed as misleading. (1) Fifteen composers were represented by a single composition which was only performed once; (2) 29 composers were represented by one work in Cantelli’s repertoire which usually received seven performances or less; (3) finally, there were another 24 instances where composers were represented by more than one work but he conducted just a solitary performance of a particular composition. Thus well over 50% of the composers in his repertoire were represented by just one work and practically 20% of the works he conducted received a single performance. This Roussel comes into the second category above and Cantelli conducted the Sinfonietta on just two occasions, the first being with a chamber orchestra in 1946. It is easy to understand why he returned to the piece when he had the superb strings of the NBC Symphony Orchestra at his disposal. This short work in three movements was composed in 1934 and is lively and certainly Cantelli’s performance is neat and precise. Little need to be said about this ‘end of term’ piece. Cantelli only included it twice as part of an actual concert programme (this was one of those) but gave it on 18 occasions as an encore. One of the most puzzling features of Cantelli’s repertoire was the absence of this composer’s works: one would have thought that the music would have been ideally suited to his temperament. There was just one overture – Le carnaval romain – which again comes into category three mentioned above by receiving a solitary performance. 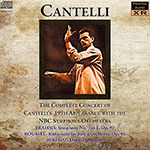 The remaining three discs are each devoted to complete Cantelli broadcasts—his 19th, 30th, and 31st appearances with the NBC Symphony Orchestra. The symphonies therein represented—the Brahms Third, Schubert “Unfinished” (a typographical error on the cover gives the key as A Minor rather than B Minor), and Tchaikovsky “Pathétique”—were all recorded commercially by Cantelli with the Philharmonia Orchestra in 1953, 1955, and 1952, respectively. The wonderfully textured live concert performance of the Brahms is, well, more alive than the still beautiful studio recording; the live Schubert is likewise preferable to the studio account, particularly in the broadcast performance’s more forward-pressing second movement; and the Tchaikovsky, given the live context, ultimately, and perhaps necessarily, feels more exciting, deeply probing, and better integrated than the very fine studio account, which was recorded over the course of five days. The performances of the Wagner and Rossini overtures are both gripping and exciting; each of these works also exists in other Cantelli-led accounts, including a 1949 commercial recording of the Rossini with the Santa Cecilia Orchestra, and a 1949 NBC broadcast of Rienzi that is less well controlled and integrated than the present 1953 broadcast. Roussel’s Sinfonietta for string orchestra and Britten’s Sinfonia da Requiem represent works that received hardly any performances under Cantelli’s baton; each is the conductor’s sole preserved account. His only other performance of the Roussel was in 1946, with the Orchestra da Camera in Milan. Besides this 1953 Sinfonia da Requiem broadcast—an intensely dramatic and probing account that makes one wish he’d had time to lead more of Britten’s music—he also led the work in 1952 with the La Scala Orchestra and in 1956 with the New York Philharmonic. (An aside: though seemingly unavailable as I write, another 20th-century work particularly worth seeking in its sole Cantelli recording—in fact his only performance of it, from a 1953 NBC broadcast—is Barber’s School for Scandal Overture, a non-traditionally spacious, individual rendition that nevertheless proves convincing, meaningful, and important.) Berlioz’s “Rákóczi March” figured in Cantelli’s repertoire mainly as an encore piece; this, his only preserved performance, actually comes across better in its cleaner, less congested Music & Arts transfer (perhaps a function of the source material)—the only instance where I found Pristine’s version not at least equal to, or better than, earlier releases. For instance, I heard no meaningful difference when comparing the Brahms Symphony No. 3 on Pristine to the same performance as heard in the aforementioned 12-disc Music & Arts set. So, in sum, here is yet another treasure trove of Cantelli material that should surely be of interest to those already initiated, as well as (one can always hope) to anyone not yet familiar with the conductor’s work. All of Pristine’s releases are available either as downloads or CDs via Pristine’s Web site, www.pristineclassical.com. Finally, let me again mention Keith Bennett’s Guido Cantelli: Just Eight Years of Fame, which is now the prime source for detailed information on Cantelli’s concerts and recordings, with much else about his life besides. (For further info on that, e-mail gcpublishers@keithbennett.waitrose.com.) It doesn’t come cheap, but its value to collectors is not to be questioned. And drawing upon his work for that book, Bennett is now providing the notes for Pristine’s latest Cantelli releases, including, of those discussed here, the conductor’s 19th, 30th, and 31st NBC concerts and Mozart Requiem. This article originally appeared in Issue 33:3 (Jan/Feb 2010) of Fanfare Magazine.